Give the gift of a worry-free environment for guests during medical treatment. Common, everyday germs can become a serious threat to people who undergo high doses of chemotherapy or are immunosuppressed due to transplants. Editha House is dedicated to providing such an environment for our guests. Rooms are cleaned to standards that exceed expectations, and layers of protocol are followed to ensure that they remain pristine. In between each guest stay the entire room, including the walls and ceiling, are sterilized. All linens and towels that are provided to guests are cleaned weekly and replaced frequently. Mattresses and sofas are vacuumed and scrubbed meticulously and replaced when worn. This effort comes at a cost. Each of the 16 guest rooms at Editha House exceeds $100 per day to operate. These costs are covered in part by guests' donations and regular funding, but in 2018 we are seeking help from the public through our "Name a Room" Campaign. With your support, we can help more families. Please consider giving today! 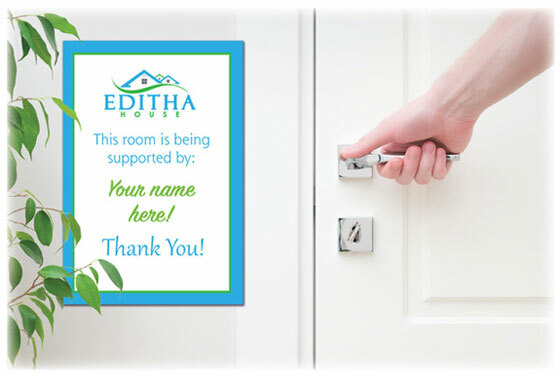 When you donate to the "Name a Room" Campaign, a sign will be posted next to one of the 16 guest rooms at Editha House in the name of your family, your business, or any name you choose. Consider requesting a special night to name a room, such as a birthday or anniversary, or allow Editha House to decide.